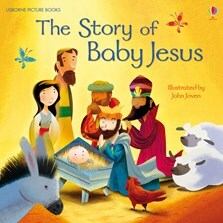 A colourfully illustrated retelling of the story of the Nativity for young readers. Follow Mary and Joseph as they travel to Bethlehem and the baby Jesus is born. This version of the Christmas story in a picture book format is perfect for sharing, but will also be enjoyed by children just starting to read alone. A colourful and approachable introduction to the key stories and characters in the Bible. A colourful and approachable introduction. A good book to show the tinies that there is meaning behind all the tinsel. A beautifully and simply told rendition of the Nativity, explained with reverence and in charming detail... ideally suited to younger readers.